Learn how to monitor Windows hosts using the WMI ActiveGate extension. 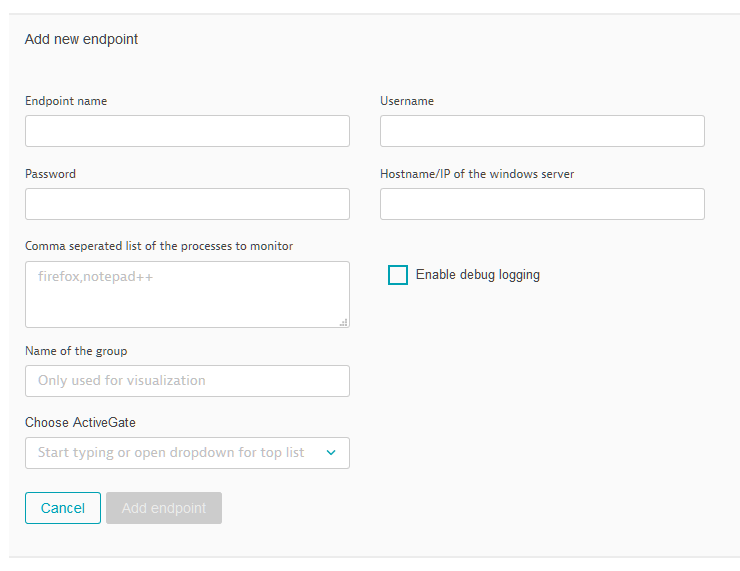 Interested in monitoring your older Windows hosts with Dynatrace? Obtain the install file (custom.remote.python.wmi.zip). Don&apos;t rename the file. Unzip custom.remote.python.wmi.zip to the plugin_deployment directory of your ActiveGate host. If the resulting directory structure isn&apos;t .\plugin_deployment\custom.remote.python.wmi\, please make the neccessary changes. Click the Upload plugin button and upload custom.remote.python.wmi.zip. Comma-separated list of the processes to be monitored.